Bottom-up (e.g. resource quality) and top-down (e.g. predation) factors have strong effects on the fitness and distribution of small herbivores. Herein, we investigated how food quality and refuge offered by macroalgal hosts influence the distribution of a mesograzer. We used the herbivorous amphipod Cymadusa filosa and seasonally evaluated its association with the macroalgal hosts Sargassum filipendula, Padina gymnospora, and Dichotomaria marginata on a subtropical rocky shore from the Brazilian southeastern coast. Feeding experiments were conducted to test the food value of hosts, while predation experiments in the field and laboratory were performed to investigate the refuge value of the macroalgae. Cymadusa occurred on Padina in a density greater than that observed on Dichotomaria and Sargassum, while Dichotomaria harbored more amphipods than Sargassum. 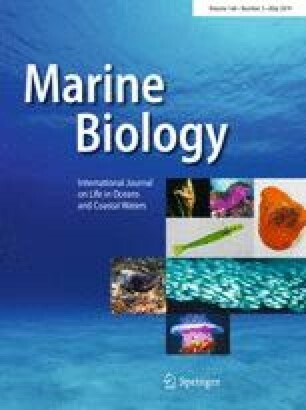 Adults of Cymadusa showed a higher consumption of Padina and Sargassum in both choice and no-choice feeding experiments and juveniles had greater growth and reproductive potential when feeding on such macroalgae. In the predation experiment in the field, Padina was a better refuge for Cymadusa than Sargassum. However, no difference in refuge value among hosts was observed in the laboratory assays. The distribution of Cymadusa was explained by a balance between food and refuge values of hosts, with higher abundances being observed in the high-quality food alga that provides refuge against predators (e.g. Padina), while fewer individuals occurred in other high-quality food that was less suitable as refuge (e.g. Sargassum). Therefore, predation may be more of a determinant for distribution of that mesograzer than resource quality. We thank Aline Neufeld and Silvana Siqueira for assistance with field and laboratory work. We thank Marília Bueno, Pedro Bergamo, Edson Vieira and Bruno Rodrigues da Silva for their valuable comments. We are very grateful to the reviewers for their valuable comments and suggestions. This work was financially supported by the São Paulo Research Foundation (FAPESP) Grant to GBO Machado (No. 2013/17629-9). This study was financially supported by the São Paulo Research Foundation (FAPESP) Grant to GBO Machado (No. 2013/17629-9). All applicable international, national and/or institutional guidelines for sampling, care and experimental use of organisms for the study have been followed and all necessary approvals have been obtained.